All inverters convert direct current (DC) electricity into alternating current (AC) electricity. That's where the similarities end between inverters. These days, a huge number of brands and options are available to consumers. The correct choice depends on how you intend to use the inverter. Options range from small mobile power units to mid-sized stationary inverters for powering homes in either remote off-grid or urban on-grid locations, to magnum-sized inverters and groups of inverters networked together to run large businesses and even small communities. For portable power needs, smaller inverters, ranging in size from 100 to 2,000 watts or more are available for either marine , RV , or other smaller off-grid applications , such as a tool shed or barn. 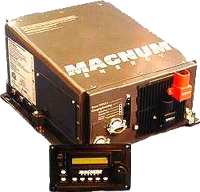 These portable inverters are meant for locations without utility electricity, and are used to convert DC electricity from a battery that is either charged by your vehicle's motor, or a standalone generating source like a photovoltaic (PV; solar-electric) panel , wind generator , or engine-generator. Marine inverters are built to withstand harsh weather conditions and corrosion from exposure to salt water, so if you're planning to use your inverter on a boat, choose a seaworthy type. Depending on the types of appliances you will be running and how sensitive they are, you can choose between pure sine wave inverters or what are called square-wave or modified square-wave inverters. Modified square-wave inverters cost less than pure sine-wave inverters because they perform less sophisticated power conversions, delivering choppier transitions in the alternating current's output. When running appliances that have motors (such as refrigerators, drills, fans, etc. ), modified square-wave inverters will run these motors hotter and consume 30% more energy than if you used a pure sine-wave inverter. It's a bit like running a car on square wheels instead of round ones. The car will go forward, but it will run far less efficiently and the ride will be darn bumpy. For some appliances and electronics, such as motors, televisions and computers, and battery chargers for cordless tools, a poor waveform can cause overheating, damage the equipment, or even cause complete malfunction. Other potential problems are inverter noise in devices like compact fluorescent bulbs , radios, stereos, and televisions. For most people, the small difference in price makes it worthwhile to buy a pure sine-wave inverter in the first place so that they don't face limitations later if they want to use their inverter for another appliance. The size of your portable inverter depends on what appliances or tools you are planning to use and their power requirements, called the "load." You will need to know how many continuous watts your tools require to run, how many different tools you plan to run at the same time, and also how much of a surge, or power draw, they have when first starting up, as with some larger motors like power saws. This information for each tool is usually found on what is called a "nameplate." The nameplate rating will give the information either in watts or in volts and amps. For general purposes, multiplying the volts times the amps gives you the number of watts (V x A = W). For determining power surge requirements, see the tool manufacturer's specifications, measure with an ammeter, or "guesstimate" it by multiplying the continuous watts times three (although the surge can sometimes be as much as seven times). The largest share of inverters being sold on the worldwide market today are for use in home energy systems. In the early days of the industry, inverters were built for remote, off-grid use where commercial power was unavailable. However, today most inverters in developed countries are being used for on-grid applications where utility feed-ins or interties allow for clean, renewable energy to be produced and distributed into the larger public utility systems, displacing some of the energy previously supplied by burning coal and oil, or nuclear reactors. Off-grid and on-grid inverters serve two entirely different types of needs. On-grid inverters are subdivided into two further categories -- with and without battery backup . The type of inverter you will need is based on whether or not utility service is available at your location, and if available, how reliable that service is compared to your needs. As primitive as the earliest inverters were, they provided the ultimate luxury and modern conveniences for living in wilderness locations far from civilization. While this market still exists to a limited extent in the United States, off-grid systems are more prevalent in countries with a less developed nationwide utility infrastructure. No matter where you are, if your property is off-grid, it's likely that bringing in the utility even a short distance will cost a great deal more than setting up your own off-grid electrical system. Off-grid inverters are much more sophisticated these days, with capabilities of coordinating battery maintenance and charging regimens, and turning on backup power automatically, making these systems easier to maintain, simple to use, and worry free. As with portable systems, while less expensive inverters are available for off-grid homes, the difference in price hardly compensates for putting up with the inconvenience and inadequacies, except for the most primitive of cabin or remote application systems. Choosing the right inverter for your off-grid system is based on accurately calculating your electrical loads and usage patterns. This assessment needs to be done carefully and with absolute honesty to yourself so that your entire system is sized correctly and will function without failure. The size inverter you need is based on what is called your "peak load" requirements -- all the AC loads that could be turned on at the same time. You may find that you need to approach your load calculation exercise more than once in your planning phases because reducing your loads will yield very big savings in how large your system needs to be and how many hours your backup generator may need to run. The standard axiom in the industry is that every dollar spent on efficiency will yield $3 to $5 in system cost savings. 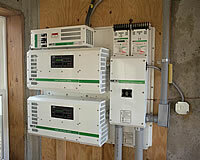 Inverter efficiency is another factor to monitor carefully for a home energy system. Inverters are generally most efficient when operated at or near their peak output, for example, a 1,500-watt inverter powering close to a 1,500-watt load. Most of the time, however, your inverter will be running a wide range of loads, usually not at its peak capacity. So, choose an inverter that has high efficiency over a broader range of loads. Other considerations are to match the inverter to the system's input voltage (often 12,24, or 48 volts), and an output voltage that matches the loads, i.e., 120 or 240 volts. Collect manufacturer's specification sheets and study them carefully, and ask for advice from the pros about any questions you may have. The Utility-intertied system without battery backup is the simplest and least expensive option for home energy systems. All that's required for this system are solar-electric modules and an inverter , connected to your home's main panel , along with a disconnect switch and separate meter , depending on the local utility's requirements. In places where "net metering" is in effect, the inverter feeds whatever solar electricity your home isn't using onto the electricity grid, and the excess production is credited to your account with the utility. When you system isn't producing electricity, for example at night, your home's energy needs are supplied by the utility. Net metering allows you to reduce your electric bill each month, while supplying clean energy to the nation's electrical grid. Net metering laws have been passed in most states within the USA. However, some small electric co-ops and municipal utility districts may not be required to participate, even where states have passed legislation enabling the practice. So check your state's regulations (www.dsireusa.org ) and then check with your utility for their requirements before you decide on this type of system. Many states have incentives such as tax credits, and may offer rebates for qualifying systems, in addition to the federal tax credits currently available. (Some utilities also have special incentive programs.) You can find out what's available to you, what the requirements are that you must meet, and how to claim your refund through the Web site listed above or by contacting your state's department of energy and your local utility company. Choosing the correct size inverter for this type of system is easy because it's a matter of how much production you will have running through the inverter. First, you need to know the amount of total watts in your solar array, according to the nameplate. The rated watts are based on a measurement of the output under Standard Test Conditions (STC). The testing uses an ambient temperature of 77 degrees Fahrenheit and perfectly sunny conditions. Of course, your solar panels will not always have ideal conditions, so you will need to take that into account for your calculations. Colder temperatures boost the panels' performance above the STC ratings, while warmer temperatures de-rate the production figures. Most manufacturers provide online calculators or specification sheets that take into account your location's specific variables to help you figure out the correct inverter for your size system. The biggest factors to consider when choosing between inverter brands for an on-grid application without battery backup are inverter efficiency and reliability. Most inverters on the market today can boast an efficiency rating above 90%. The largest downside of this type of system is that if there is a power outage, your system will go offline, since the inverter must sense the utility's presence and match its frequency perfectly in order to work. If you are worried about power outages, consider using a system with battery backup power . 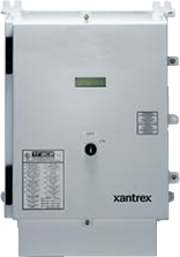 On-grid systems can be configured with a battery backup system. Battery backup systems carry the penalty of added expense and often decreased efficiency, so take a realistic look at your needs before choosing this option. First, think back about how many times the utility power has been out in the last five years or so, and for how long. If you live in tornado or hurricane country, and power outages are frequent and longer in duration than a few hours or a day, seriously consider adding battery backup to your system. If you have critical loads in your home, for example medically necessary health equipment, or you have elderly or frail individuals living in the home and they couldn't withstand a power outage in extreme heat or cold conditions, then this is definitely the system for you. Or perhaps you have a home business that relies on being electrified continuously for you to stay profitable, or your area experiences many rolling blackouts that wreak havoc with your computer files being lost. Most battery backup systems are configured to enable just one or two circuits that can keep your critical loads on for a period of several days to a week or more during a blackout. This type of system uses utility power when available, and only transfers the loads to the battery in case of an outage. Once the utility comes back online, the loads are transferred back to the utility, and the batteries are typically recharged from the grid with the inverter's battery charger. The choice of inverter for this type of system is going to rely on the capacity of your power generating system -- either solar-electric or wind-electric -- and the amount of system operation and maintenance convenience you require, as well as ease of installation. Other major factors besides price to consider are warranty, service reliability and manufacturer reputation, along with inverter efficiency ratings. Several manufacturers offer high volume inverters or inverters that can be ganged up in multiples to run very large systems suitable for industrial applications. In addition, research has been put into creating mini-grid systems where a small community of off-grid homes can share electricity production and battery storage capacity with one another. Talk with your sales representative about this potential if this is something you would like to explore further. Call or write our technical sales staff members for help on putting together a quote for a solar air heating, solar water heating, micro-hydro, wind or solar electric system that will meet your needs.